Sometimes my annuals will establish their seedlings in the most ridiculous places. Occasionally a self-seeding annual is expelled for unacceptable garden behaviour. This judgment is a very personal thing - I have friends who will not allow Forget-Me-Nots in their gardens. Fancy missing out on those feathery drifts of blue in the spring! In my younger, impressionable years I read a gardening book called Colour by Design. Therein I met an exciting foliage plant called red Orach, Atriplex hortensis. It was said to be a super-stylish cattle-fodder. I loved the look of it in the book's garden borders. I've collected up images of my favourite flowering annuals and presented them here. All the photographs are recycled from other pages. Like the flower garden itself they look rather gorgeous growing all together! I first introduced Calendulas into my vegetable garden, thinking they might be good companion plants for potatoes and tomatoes. They've flowered there ever since, self-sowing with generous yet good intentions. I love them! This pretty flowering annual is wonderful to grow. Omphalodes linifolia will self-seed without being a nuisance, and the seeds are easy to collect for home production. It will flower beautifully in full sun or in part shade. The foliage is a beautiful blue-green colour. It's faultless! 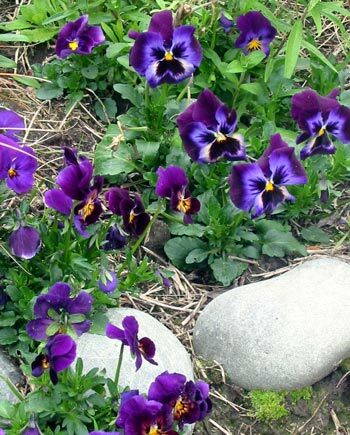 Violas and pansies are irresistible with their cheeky little flowery faces. I enjoy looking at their different colour patterns and trying to work out possible parents. I love what my designer bees do to pansies! Lychnis is encouraged to self seed in my garden. Originally I thought that only the white variety would be welcome, and I carefully collected seeds off the first plant. I didn't realise how prolific Lychnis was, or how much my colour tastes would widen. It's nice to think that the first Alyssum (Sweet Alice) plant came here with a bagged rose from my old garden. I enjoy their white flowers which turn up in the driveway and in paving cracks on the front path. Honesty is a very valuable biennial which brings the spring garden alive. The most desirable forms have variegated leaves, and my favourite has white flowers. It's super stylish! Foxgloves have to be one of the most timeless plants in a garden. They are considered by some to be weedy. Others see foxgloves and immediately think of the prettiness of the cottage garden. I'm with them! I grow variegated Mallows (Malva) for their foliage as well as their small lilac flowers. I discovered Kings Seeds seed catalogue in 1998 and among my first order was a packet of these seeds. I thought I'd like them, but I had no idea how well they would grow. In some parts of New Zealand there are large tracts of Russell lupins which grow by the roadsides. Their combinations of blues and pinks are a tourist attraction, and the subject of many bus stops for photographs. In my garden Coreopsis is not perennial - the plants don't last over winter. So I grow my Coreopsis from seed. This year I've tried a beautiful deep red variety called Mahogany Coreopsis. Sometimes the most humble self-sown annual makes huge contributions to a garden and gets absolutely no credit - it's taken completely for granted, with rarely a photograph. That's the yearly fate of my annual pink, blue, and white Forget-Me-Nots. Nasturtiums brighten up many of my garden borders and garden pots. They self seed happily, and give great colour for months of the year. This purple cornflower is a sentimental favourite annual - I first saw this colour in the famous Somerset gardens of Hestercombe, which I visited on my great English Garden Tour and Adventure in the summer of 1996. Cerinthe are absolutely beautiful free seeding annuals with blue-green foliage and small purple flowers which hang down. They are happiest in semi-shaded woodland areas in the Moosey garden. This annual Salvia is sometimes known in seed catalogues as annual clary sage, which is a pity as it is nothing like the clary sage that I grow. There are three colours - white, pink and deep blue. The feathery leaves and delicate daisy flowers of Cosmos make them a favourite annual in the garden. I always look forward to the late summer days when they are at their flowering peak. Gardeners will know the normal types of cosmos, in colours of pink, lilac and white, but may not know this shorter form. I bought seeds two years ago, and used the grown plants as fillers for one of the new gardens over the water race. I grew my first Nicotiana Sylvestris plants from seed, not realising how fond I would become of these crazy big plants. When the leaves first form in spring they are a beautiful clean green colour, with patterns in the veins highlighted in the sun. The first year that I ordered seeds from a winter catalogue I spent hours and hours writing and rewriting lists. There were a number of varieties of Nicotiana offered, and I ordered them all. I particularly liked the look of the lime green ones. The soft pink flowers of this annual Lavatera have a silvery sheen. They are easy to grow from seed, which germinates readily throughout spring, summer, and autumn. Hollyhocks are great plants for summer colour and height. They are reliable performers, and their seedlings always appear in interesting places. Eschscholzia, or Californian Poppies, have colonised many dry river beds in Canterbury. Surviving just on the natural rainfall, I decided that they were my sort of flowers. The basic orange ones look great on dull days.